This cat just earned Eadweard Muybridge $25,000. Ah, baseball. The crack of the bat, the smell of hot dogs, the pitter patter of wittle paws as a cat scampers across the field. Thursday was MLB’s Opening Day, but it was the KBO League that turned in the real highlight. (Its season opened last Saturday.) 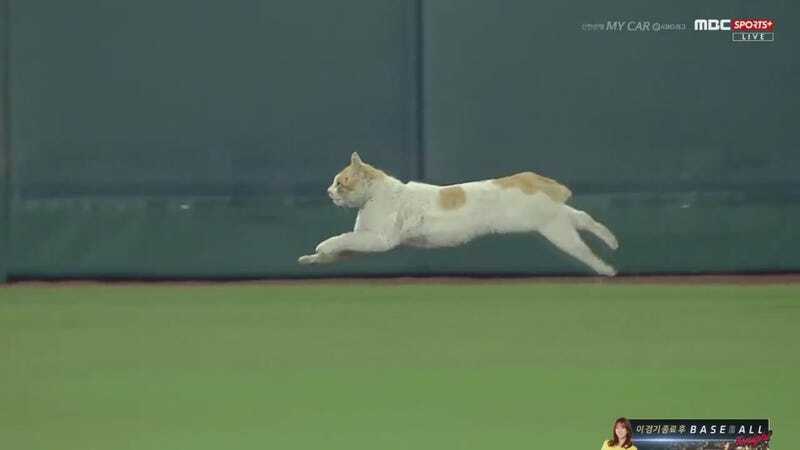 During a game at the Busan Sajik Baseball Stadium, a kitty cat ran across the field. Look at it go! According to KBO writer Dan Kurtz, cats are a semi-regular occurrence at Sajik, interrupting Lotte Giants games every once in a while. Who doesn’t want to go see a Korean baseball game now?